Published by Hodder and Stoughton Ltd., London Ninth Edition 1900. 1900. 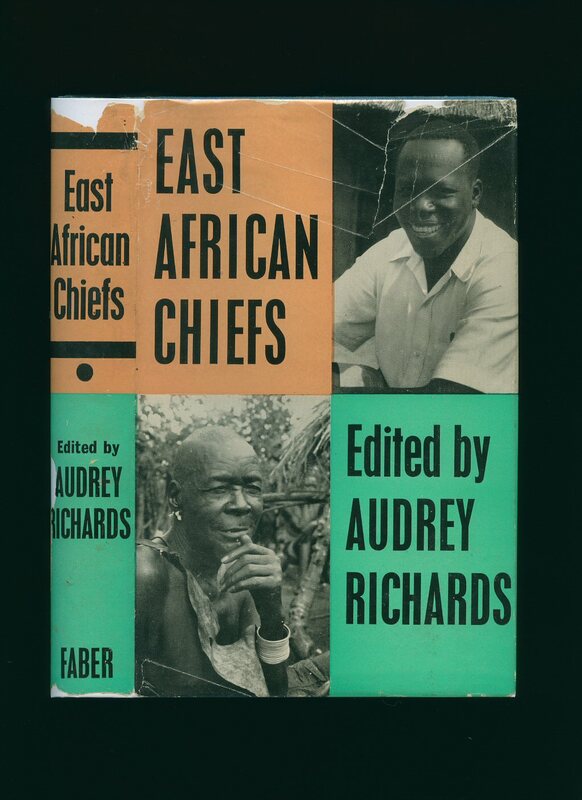 Hard back binding in publisher's original strawberry cloth covers, black title and lettering and African Warrior's to the spine and the upper panel. 8vo. 7½'' x 5¼''. Contains [viii] 323 printed pages of text with monochrome frontispiece. Working condition copy with cracking to the front hinge, fraying across the spine ends, contents clean and sound. Member of the P.B.F.A. Published by The Religious Tract Society 4 Bouverie Street and 65 St. Paul's Churchyard, London First Edition 1906. 1906. 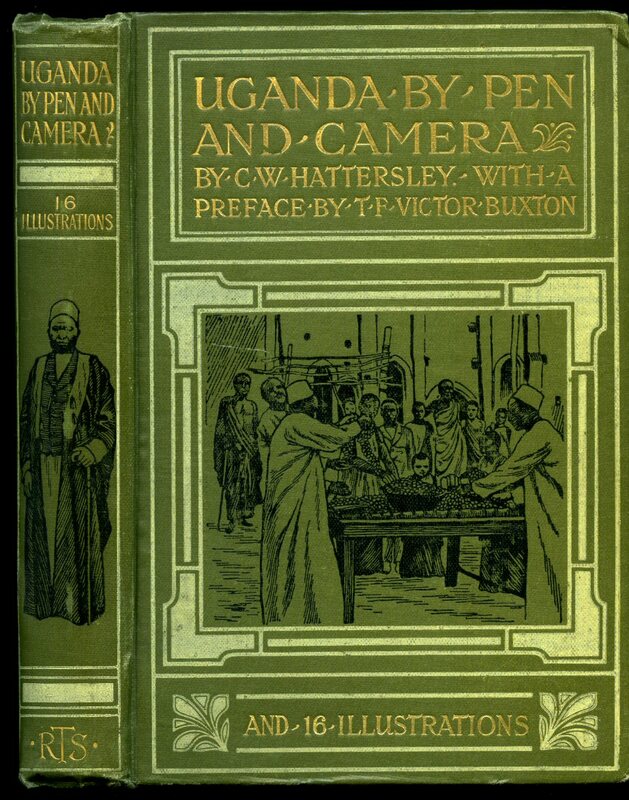 First edition hard back binding in publisher's original illustrated sage green cloth covers, gilt title and author lettering to the spine and to the front cover. 8vo. 7½'' x 5¼''. Contains [xvi] 138 (+ 4 page catalogue) printed pages of text with frontispiece photograph plus 23 other pages of monochrome photographs throughout. Light foxing to the closed text block edges and in Very Good condition, spine not faded, no dust wrapper. Member of the P.B.F.A. Published by Seeley & Co., 46, 47, 48 Essex Street, Strand, London, Twenty-Fourth Thousand 1887. 1887. 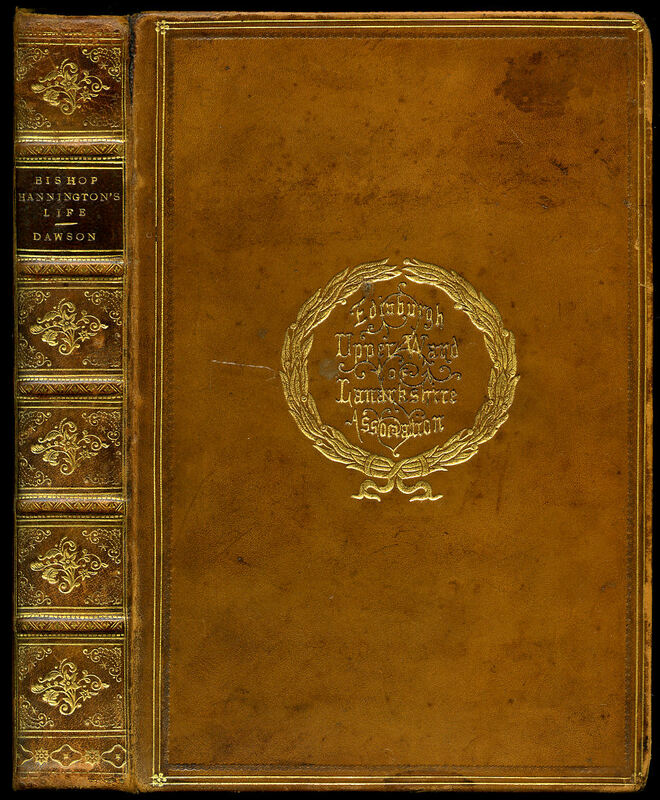 Superior prize hard back binding in original full highly polished leather covers, gilt title and tooling between raised bands to the spine, gilt motif to the front cover 'Edinburgh Upper Ward of Lanarkshire Association', all page edges gilt, green marble paper end papers. 8vo. 7½'' x 5¼''. Contains [viii] 392 pages with frontispiece + 1 folding map, with monochrome illustrations throughout. Edinburgh Upper Ward of Lanarkshire Association prize plate inside, light rubbing to the joints and in Very Good clean condition, super copy. Member of the P.B.F.A. Published by Macmillan & Co. Limited, 4 Little Essex Street, London First Edition 1955. 1955. First edition hard back binding in publisher's original blue cloth covers, gilt lettering to the spine. 8vo 9'' x 6'' x, 243 [pages.]. Monochrome illustrations throughout. Small name to top of front end paper, light foxing to page edges. Very Good condition book in near Very Good condition dust wrapper with colours to the spine sun faded, short closed tears to corners and edges, not price clipped 18s. Dust wrapper supplied in archive acetate film protection, this is not adhered to the book or to the dust wrapper and can easily be removed should you so wish. Member of the P.B.F.A. Published by Hodder and Stoughton Ltd., London First Edition 1962. London 1962. First edition hard back binding in publisher's original stone grey cloth covers, gilt title and author lettering to the spine, end paper maps. 8vo. 9½'' x 6¼''. Contains xvi, 264 printed pages of text with monochrome illustrations throughout. Ownership dedication to the half-title page. Very Good condition book, in Good condition dust wrapper with tanning to the edges of the lower cover, shallow chips across the spine ends and corners, not price clipped 25s. 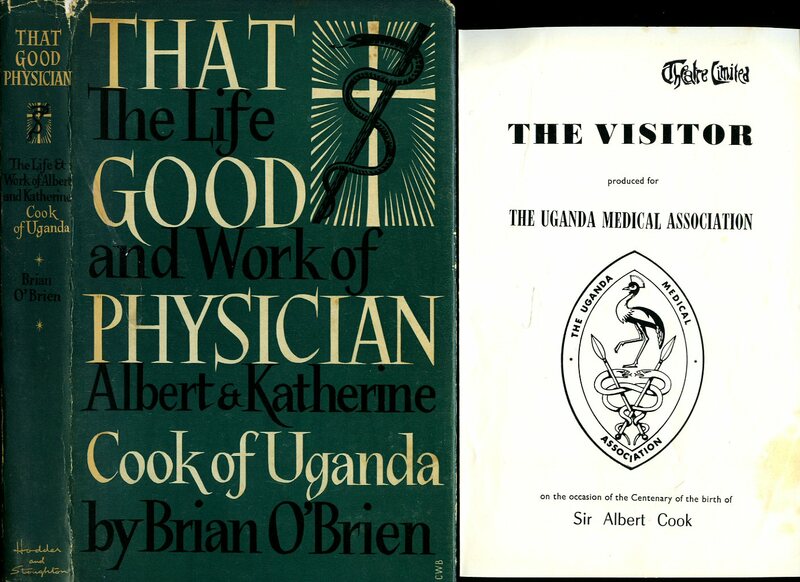 Loosely enclosed is a Theatre Programme 'The Visitor' produced for The Uganda Medical Association on the occasion of the Centenary of the birth of Sir Albert Cook. Dust wrapper supplied in archive acetate film protection, this protects and prolongs the life of the paper, it is not adhered to the book or to the dust wrapper. Member of the P.B.F.A. 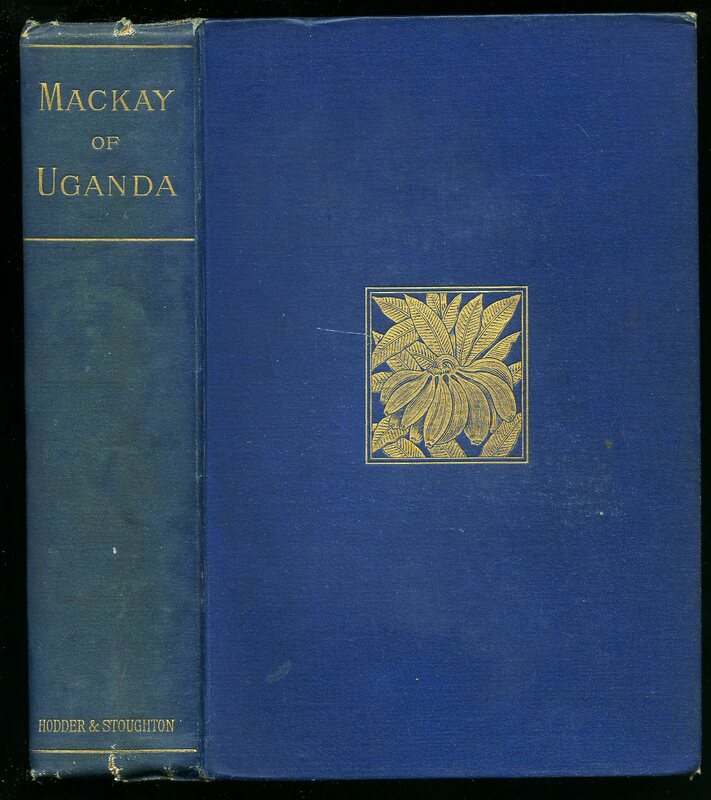 Published by Hodder and Stoughton Ltd., London 13th Edition 1906. London 1906. 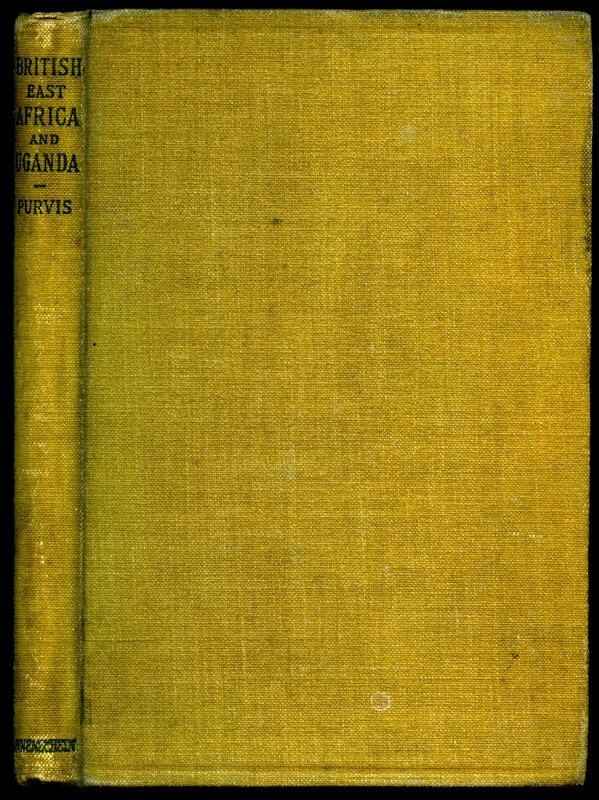 Hard back binding in publisher's original strawberry cloth covers, black title and lettering and African Warrior's scene to the spine and the upper panel. 8vo. 7½'' x 5¼''. Contains [viii] 323 printed pages of text with monochrome frontispiece and one other plate. Working condition copy with fraying across the spine ends, contents clean and sound. Member of the P.B.F.A. 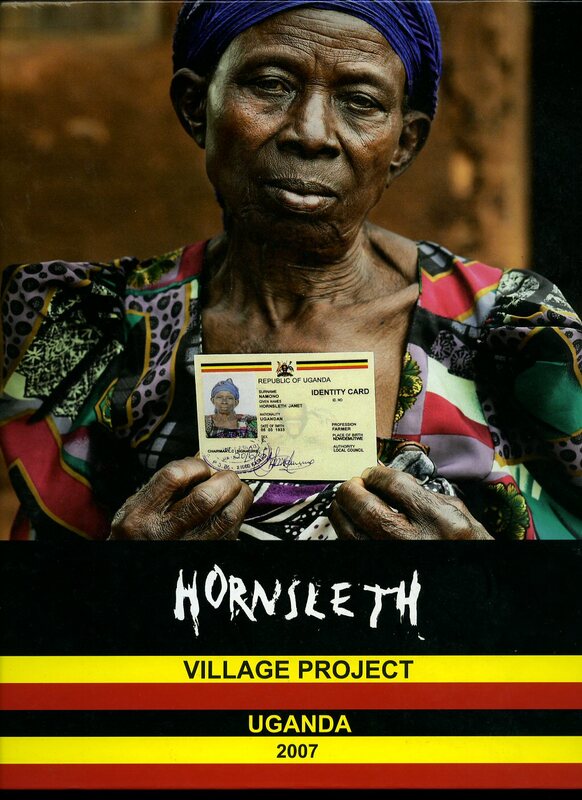 Published by Futilististic Society Publishing First Edition 2007. 2007. Published by Hodder and Stoughton Ltd., London First Edition 1890. London 1890. First edition hard back binding in publisher's original navy cloth covers, gilt title and author lettering to the spine, racing green end papers, floral gilt vignette to the upper panel. 8vo. 9'' x 5½''. Contains [viii] 488 printed pages of text with fold-out colour map to the rear. Extensive ink ownership remarks to the foot of the last page, foxing to the tissue frontispiece and the last two leaves, page edges a little dusty, spine very slightly dulled, hinges sound and tight and overall and in Very Good condition, no dust wrapper. Member of the P.B.F.A. 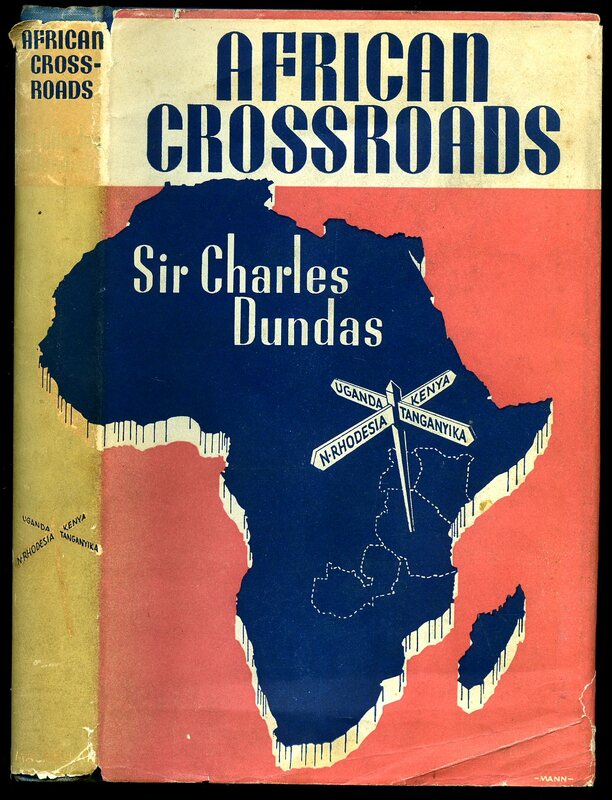 Published by The Livingstone Press, Broadway, London 1941. 1941. 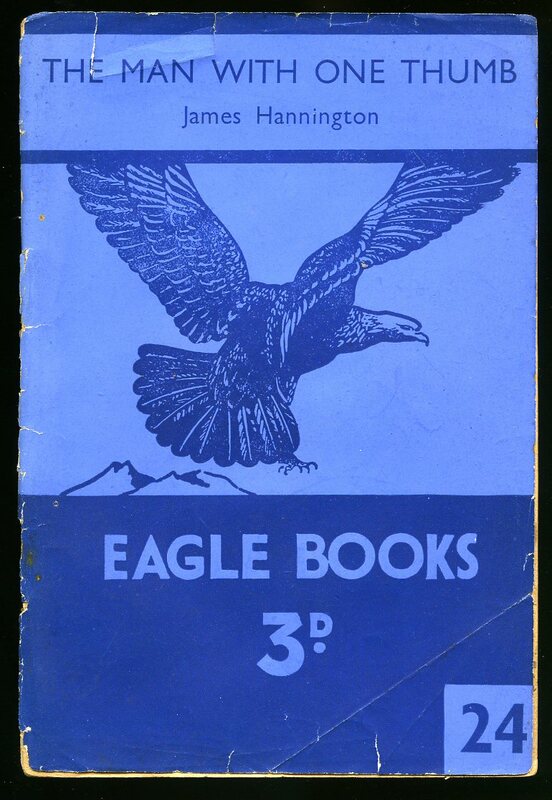 Publisher's original stapled blue and white paper wrap covers. 8vo. 7'' x 5''. Contains 32 printed pages of text. Cheap paper browning to the margins, without any ownership markings and in Good condition, no dust wrapper as published. Member of the P.B.F.A. Published by Poyntington Publishing Company, The Lindens, Poyntington, Dorset First Edition 1999. Dorset 1999. Published by Faber and Faber Ltd., 24 Russell Square London First Edition 1960. London 1960. First edition hard back binding in publisher's original sky blue cloth covers, gilt title and author lettering to the spine. 8vo. 8½'' x 6''. Contains 419 printed pages of text with monochrome map, 3 half-tones and 1 line illustration. Spine ends, edges and corners scuffed, a few age spots to the fore edges. Near Very Good condition book in Good condition dust wrapper with 50 mm closed tear and related crease lines to the upper front panel, nicks and chips to the upper spine end, not price clipped 42s. Dust wrapper supplied in archive acetate film protection, it does not adhere to the book or to the dust wrapper. Member of the P.B.F.A. Published by Marshall Brothers, Paternoster Row, London Third Edition circa 1904. circa 1904. 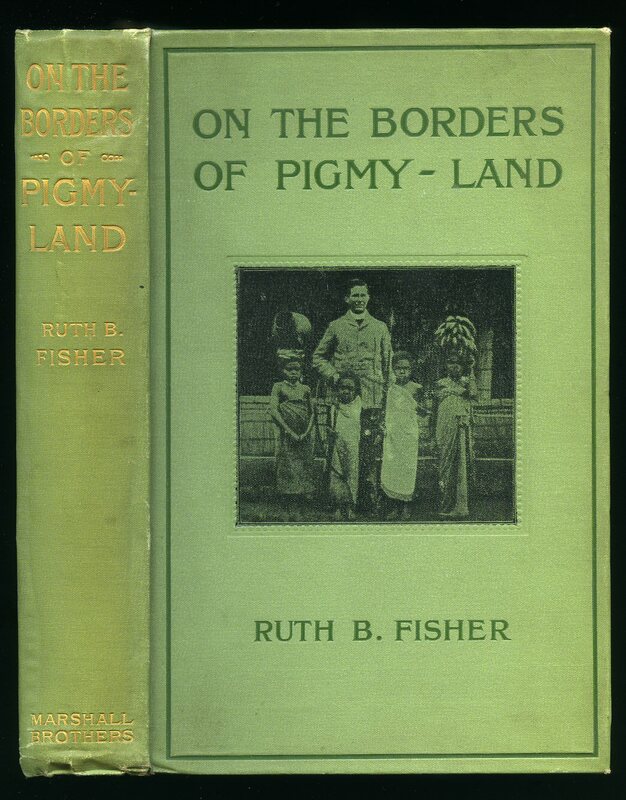 Third edition hard back binding in publisher's original lime green cloth covers, gilt title and author lettering to the spine and green with monochrome photograph with tooled frame to the front cover, fore and lower edges uncut. 8vo. 8½'' x 6''. 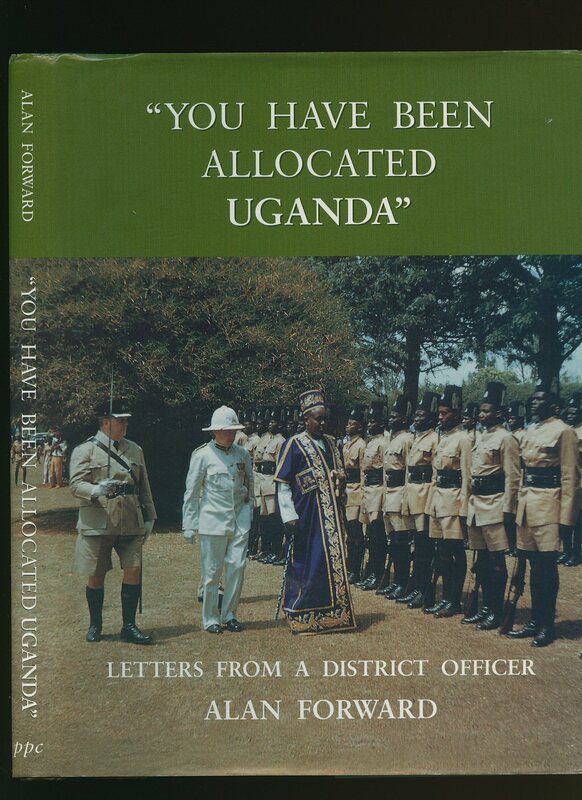 Contains 215 printed pages of text with monochrome photographic plates on coated paper throughout. Lower spine end creased and soft with tiny rubs, tan age spots to the end papers and page edges and in Very Good condition, no dust wrapper. Member of the P.B.F.A. 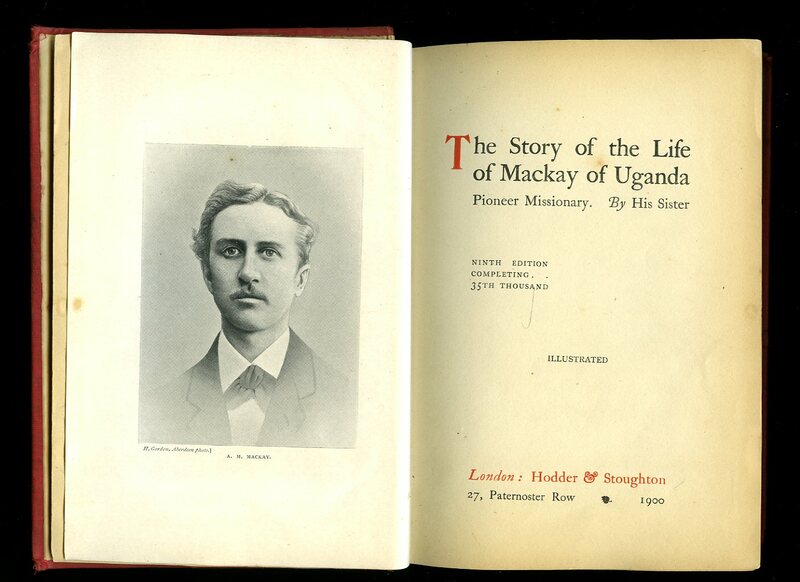 Published by Swan Sonnenschein & Co., Ltd., Paternoster Square, London First Edition 1900. 1900. First edition hard back binding in publisher's original Dijon mustard cloth covers, black title and author lettering to the spine. 8vo. 7½'' x 5¼''. 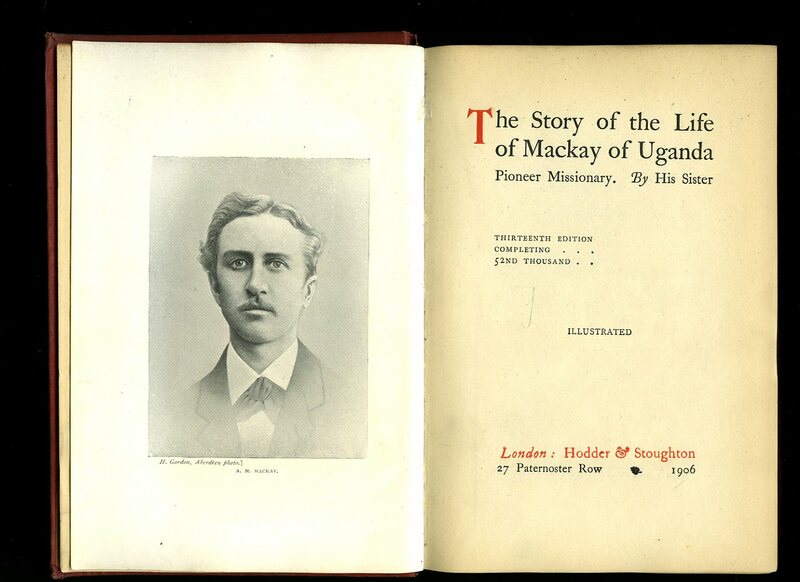 Contains [viii] + 94 pages 2 maps, tissue frontispiece, 13 interesting early monochrome photographs of Kenya taken at end of 19th century. Appendices: How to Live and Travel; List of Outfit for Three Years, in the Interior, with Probable Cost, List of Provisions for the Road as Far as Toro, and for One Year on a Station. 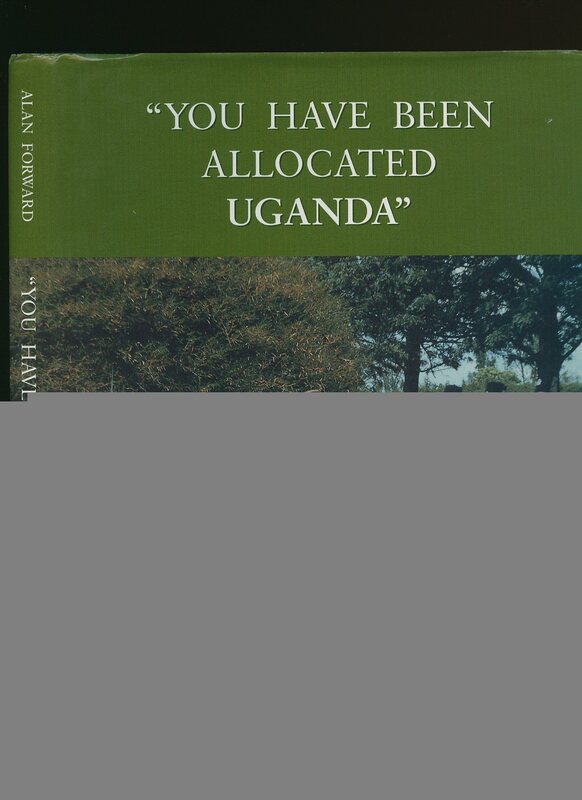 List of Useful and Idiomatic Phrases in Kiswahili and Luganda. Light soiling to the covers and in Very Good condition, no dust wrapper. Member of the P.B.F.A.